Description: One(1) XORELLA 1 CONTEXXOR, 4/-1 permanent working pressure, 151ºC permanent working temperature, 11700 Liter volume, 1991 year. 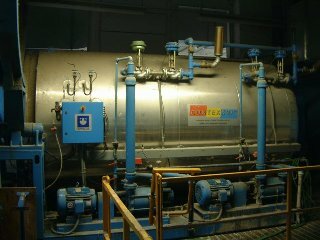 One(1) XORELLA CONTEXXOR Type COMPACT 2000 “MC 11” 1/1 permanent working pressure, 115ºC permanent working temperature, 17488 Liter volume, 1995 year. This system also includes (1) Seydel Bielefeld stretch breaker, model 682; (9) Zinser link ring spinning frames model 320sl, 1988 yr. 1080 spindles each; (1) Suessen parafil machine; (3) Zinser type 660 roving frames, 1988 yr., 108 spindles; (34)Murata Airjet Spinning frames, (2)Whitin roller top Cards; (1)Ashworth metalic wire mounting machine and (1)Laroche, "EUROP MAJOR” Tearing Line.